Windows 8 Search was not really known to be intuitive, never letting you narrow down the way your results came in. 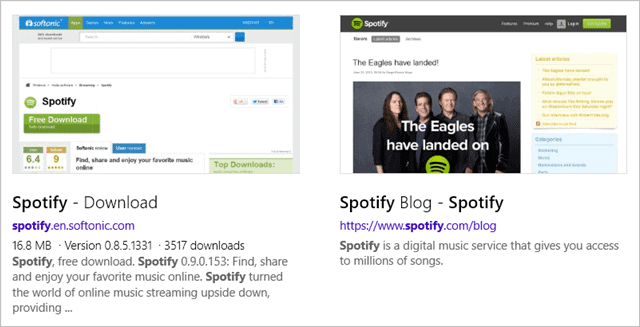 Windows 8.1 changes the way search works for the better – by introducing Smart Search – letting you truly track down and customize how you get results. Smart Search rivals even some of the better search engines, like Google, with its tenacity for intuitive search. 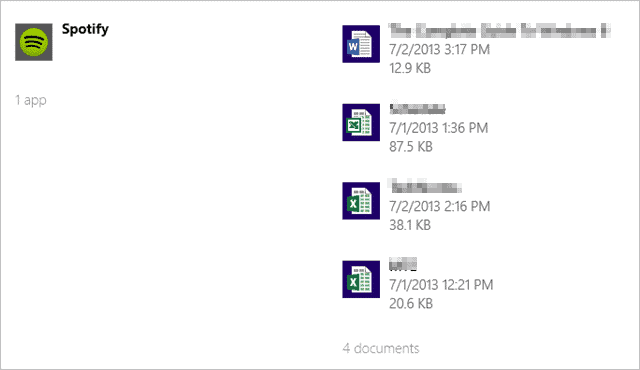 In Windows 8, you could merely search for indexed files and folders, along with apps. 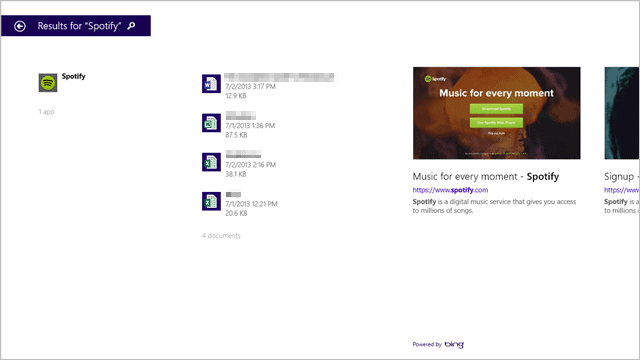 Now, you can search for everything from music to documents on your SkyDrive to Web results. 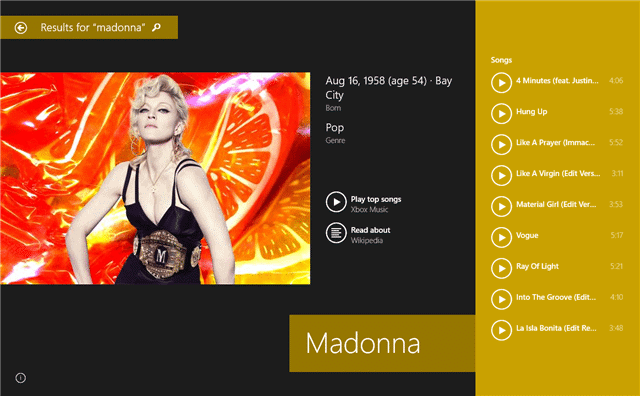 This will be your complete guide to Windows 8.1 Smart Search. Head to your Windows 8.1 Start screen. Simply type in what you’re looking for. For this example, we’ll look for Spotify. You’ll see two different areas of search results. The first area, at the top, will be any programs, apps or websites that may relate to the search topic. 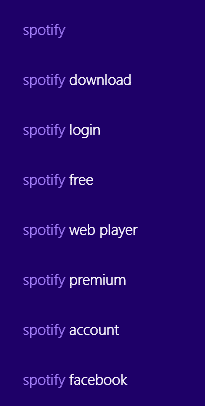 In this case, we have Spotify installed on our PC, so it shows up so we can access it. We’re also given the Web address to Spotify if we wanted to visit its site. Previously, in Windows 8, you had to classify your results by app, by website or other means. 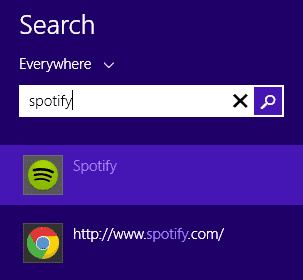 This is no longer necessary in Windows 8.1 Smart Search, but if you want to, you can click the “Drop Down Arrow” to choose a more specific search. Below the initial results, Windows 8.1 will give you some other terms related to your initial query. These are pretty spot on as far as Spotify goes. We have entries related to downloading it, logging in, its web player and premium accounts. Let’s click on the first result – Spotify – and see what Smart Search gives us. This is perhaps one of the best additions to Windows 8.1. 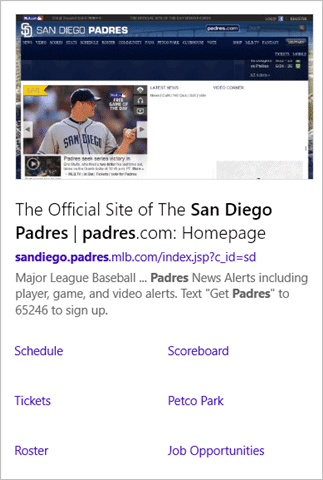 You’re given a beautiful, Bing-inspired app layout of the Smart Search results. You’ll be introduced to any apps or programs installed on Windows 8.1, along with any documents related to the search query. Next, you’ll see Web results from Bing Search on the term. If you click on any of these results, you’ll either open a program, a file or head to the website. 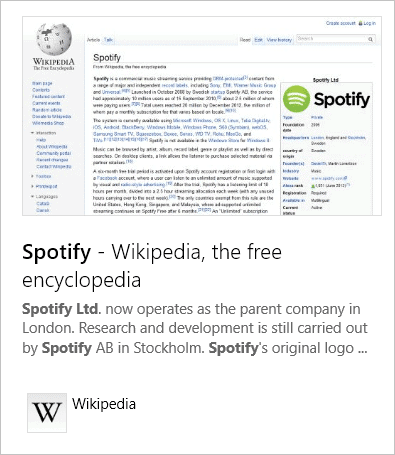 Scrolling right shows you apps from the Windows Store related to the term along with more Web results. Depending on what apps you have installed, like Wikipedia on my PC, you’ll also see results from them. If you have the default News app still installed, you’ll see news results based on the term. 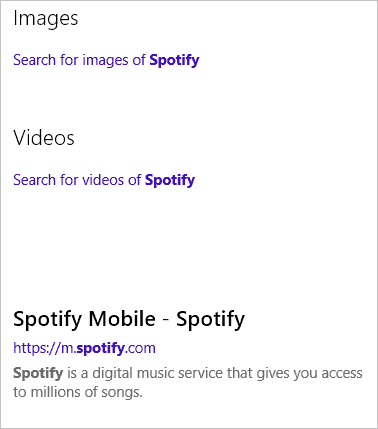 To the far right, you’ll see related search results similar to what came up when you initially searched in Windows. These can be a great way to narrow down results or find something more specific if you used a general query. If you click on any of the terms, you’ll see them laid out in a similar way as above. You’ll also be presented with links to search for images or videos related to your term, as well as miscellaneous results. Spotify is a pretty general search term. Let’s see what Smart Search can really do in Windows 8.1. Let’s search for a city. In this case, I’ll use Denver, Colorado where I currently reside. Now, you’ll see we get a totally different initial layout, including the current weather conditions, a picture of the capital building and some of the biggest attractions in the city. 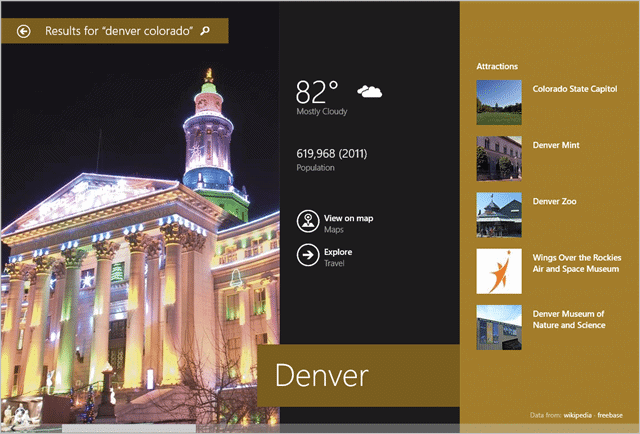 You can access map of Denver as well as travel information in separate apps on Windows 8.1. Pretty much everything you can see is clickable with more information tied to it within Windows’ plethora of apps. Scrolling to the right reveals more information on Denver, similar to what we found for the Spotify results. Let’s search for our favorite sports team. For this example, I’ll use the San Diego Padres, feel free to laugh at me. Once more, we’ll search for a music artist or band, like Madonna. Another full-screen layout, similar to how our search on Denver, Colorado worked out. 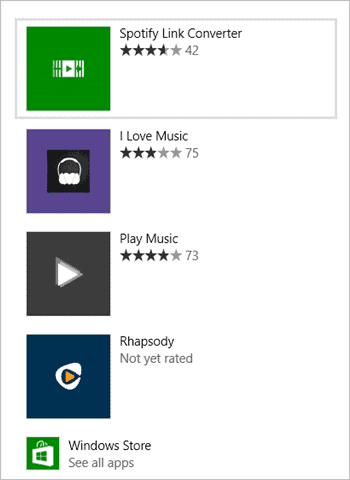 The nifty thing about searching for music is that if you’re using Xbox Music, you’ll be presented with the opportunity to listen to some of the most popular music related to them. If you click on one of the songs, you’ll open Xbox Music to play it. Scrolling to the right will give you access to albums, videos and pictures of the artist or band and scrolling even further will give you the standard results, including Web searches. The ads, from what we’ve seen above, are integrated so well into Smart Search, it’s hard to pick them out from normal search results at least for now. 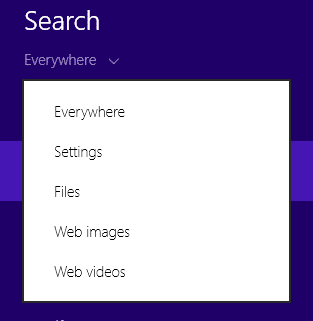 There are a variety of Search Charm issues that may appear in Windows 8.1. These range from the Search Charm not responding, being slow or otherwise nonoperational. Windows Update 2863204 seeks to correct these issues. You’ll need to run Windows Update if you haven’t already to install the update. 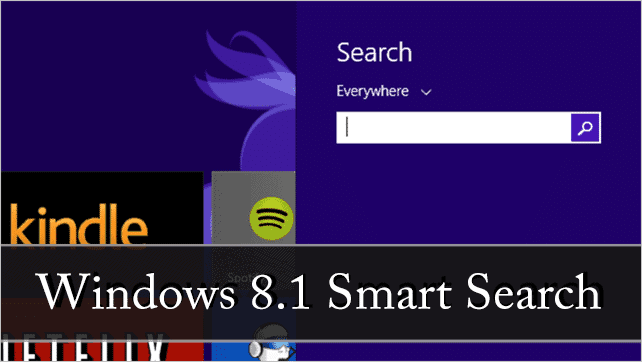 Windows 8.1 Smart Search is one of the top features to be added to the new version of Windows 8. I’ve been very impressed so far with the scope of coverage searches provide. It’s intuitive and definitely smart. Microsoft may have finally caught up to Google in ways, especially when it comes to the integration of ads into the search scheme giving them access to millions of Windows 8 users with one major update. Please Note: Smart Search worked well for us from the start, and we’ve seen no reports of issues with it. However, Windows 8.1 is still in its testing stage, so you may encounter an issue here or there. If so, let me know! I want to help our readers navigate the waters through Windows 8.1 the best I can.